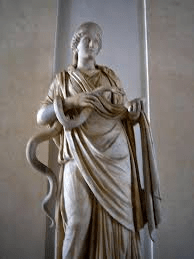 Hygiea, the daughter of Epione, the Goddess of the Soothing of Pain, and Aslepius, God of Medicine, is the Greek Goddess of Health and Healing. Hers is a healing family, as Her sisters are Panakeia, the Goddess Who Cures All and Iaso, the Goddess of Remedies. Called Salus in Rome, She is also the healer of both physical and mental disease. She is sometimes called the Protectress of Mental Health. Her symbol is a cup, or chalice, surrounded by a snake, as She is most commonly shown with a snake wrapped around Her body, holding a bowl for libations. The cult of Hygiea started in the 600’s BCE and spread during the plague of the 400’s BCE. A statue of Her stood at the entrance of the Acropolis, along with Athene. Hygiea was very holistic in Her approach to good health, professing the benefits of eating well, getting enough exercise and the concept of disease prevention from cleanliness and hygiene, from whose name comes the words and its’ variations. We would do well to follow Her advice in the present day, as well.